We’d love your help. Let us know what’s wrong with this preview of The Mystwick School of Musicraft by Jessica Khoury. Amelia Jones always dreamed of attending the Mystwick School of Musicraft, where the world’s most promising musicians learn to create magic. 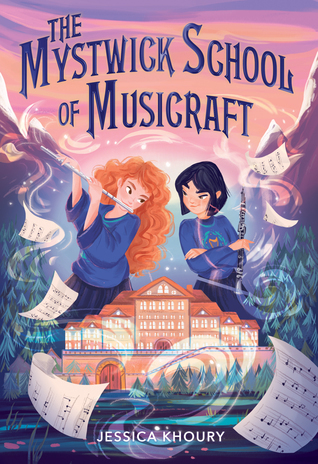 So when Amelia botches her Humor and heart shine in this middle-grade fantasy about a girl who attends a boarding school to learn how to use music to create magic, perfect for fans of Nevermoor and The School for Good and Evil series. To ask other readers questions about The Mystwick School of Musicraft, please sign up. Will this be a stand-alone or series? When not writing, Jess enjoys spending time with family, playing video games, and oil and watercolor painting. She is also a professional Jessica Khoury wrote her first book at age 4, a fan fic sequel to Syd Hoff's Danny and the Dinosaur, which she scribbled on notebook paper, stapled together, and placed on the bookshelf of her preschool classroom. Since that day, she's dreamed of being an author. When not writing, Jess enjoys spending time with family, playing video games, and oil and watercolor painting. She is also a professional mapmaker, and spends far too much time scribbling tiny trees and mountains for fictional worlds.